The global warming will increase humidity in tropical deserts. Also the higher levels of carbon dioxide in the atmosphere trigger plant growth. As predicted, due to the global warming the sea levels will rise. which emits green house gases. 2. Follow RRR-Reduce, Reuse, Recycle. impacts of global warming and methods to reduce it. 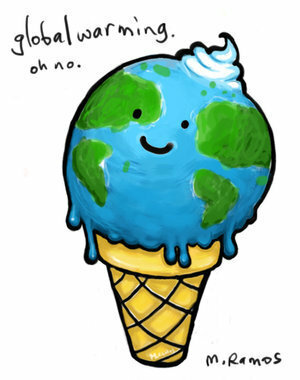 Funny but scary :) The Earth-Ice cream cannot smile anymore.